In the struggle to cling to the precipice of survival as the Twenty-First Century drags the Performing Arts into the abyss, only poetry is compelled to endeavor as heroically as opera to justify continued support of its existence by exhibiting that Holy Grail of intangible necessities: relevance. What need has the modern world for rhyming couplets and sonnets laden with meanings readers must think in order to understand? Of what practical use is setting those couplets and sonnets to music and paying people in garish costumes to sing them in languages only spoken by specific communities? Perhaps such questions never occurred to John Luther Long, who heard his sister’s and brother-in-law’s tales of Methodist ministry in late-Nineteenth-Century Japan and recognized a poetic story that deserved to be told. Published in 1898, his short story ‘Madame Butterfly,’ an anecdote of a delicate Japanese woman lured into a contractual marriage with an American naval lieutenant, attracted the attention of stage director and playwright David Belasco, whose adaptation of the story reached the New York stage in 1900. Scenes of the Spanish-American War still fresh in audience’s minds, the play’s success was indicative of the resonance of one of humanity’s intrinsic fascinations: the labyrinths of love, fidelity, and honor. Men have likely sought companionship among the denizens of distant lands as since martial ventures first forced them into proximity, and who can deny the relevance in today’s society of the counterparts of Long’s and Belasco’s Butterfly and Pinkerton, American GIs and their exotic brides—and now their children and grandchildren? It was in London, where Belasco’s play opened at the Duke of York’s Theatre in the West End only seven weeks after its Broadway début, that Puccini encountered the subject that he would bring to the operatic stage as Madama Butterfly. By his own admission, the native of Lucca, his international reputation already made with Manon Lescaut, La bohème, and Tosca, spoke even less English that the heroine of Belasco’s ‘tragedy of Japan,’ but Cio-Cio-San’s dramatic profile seized Puccini’s imagination as completely as that of Victorien Sardou’s Floria Tosca had done a few years earlier. First performed at Milan’s Teatro alla Scala on 17 February 1904, Puccini’s original, two-act version of Madama Butterfly was hissed, the hostile audience vociferously accusing the composer of having aped his own La bohème in an effort to repeat that opera’ s success. Despite an opening-night cast that included singers of the calibre of soprano Rosina Storchio, tenor Giovanni Zenatello, and baritone Giuseppe de Luca, who would also create the title rôle in Gianni Schicchi for Puccini in 1919, the opera’ s first production fell victim to insufficient rehearsal, the composer’s completion of the score having been delayed. Dismayed but perhaps not wholly surprised by the Milanese audience’s antipathy, Puccini withdrew the score and quickly reworked it, enlarging the opera’s structure with, in part, the addition of a third act and the Humming Chorus. Thus modified, Madama Butterfly reintroduced herself in Brescia on 28 May 1904, and was given a welcome worthy of her inherent nobility. Though the opera’s Metropolitan Opera première in February 1907 was famously anchored by Geraldine Farrar as Cio-Cio-San, Enrico Caruso as Pinkerton, Antonio Scotti as Sharpless, and Louise Homer as Suzuki, with Puccini in attendance, Madama Butterfly in fact received its first American production in Washington, D.C., in October 1906. Washington National Opera’s 2017 production is therefore a homecoming of sorts. Having received more than 800 performances at the MET in the 110 years since it was first performed there, Madama Butterfly remains one of opera’s most enduring works, one that can exert its emotional force in virtually any staging that treats the story with respect. 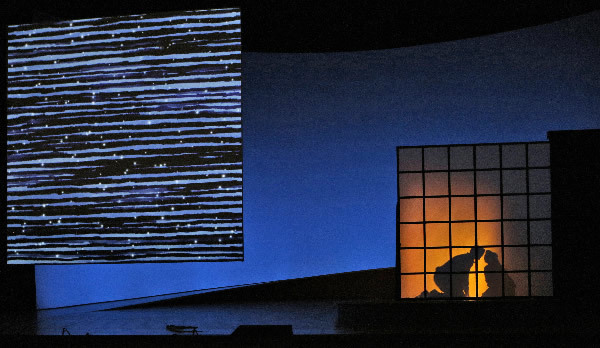 In Washington National Opera’s production, shared with Opera Omaha and San Francisco Opera, Japanese-born artist Jun Kaneko’s primary-color sets, projections, and costumes provided a two-dimensional backdrop against which the three-dimensional, pastel-hued narrative of Cio-Cio-San and her tribulations played out. Kaneko’s vivid color scheme sometimes seemed borrowed from a comic strip, making it seem as though Pinkerton’s home ship was the Enterprise rather than the Abraham Lincoln and bringing Lo zio Bonzo and his attendants into perilous proximity with Ku Klux Klansmen, but the production’s simple, sketch-based imagery was often effective. 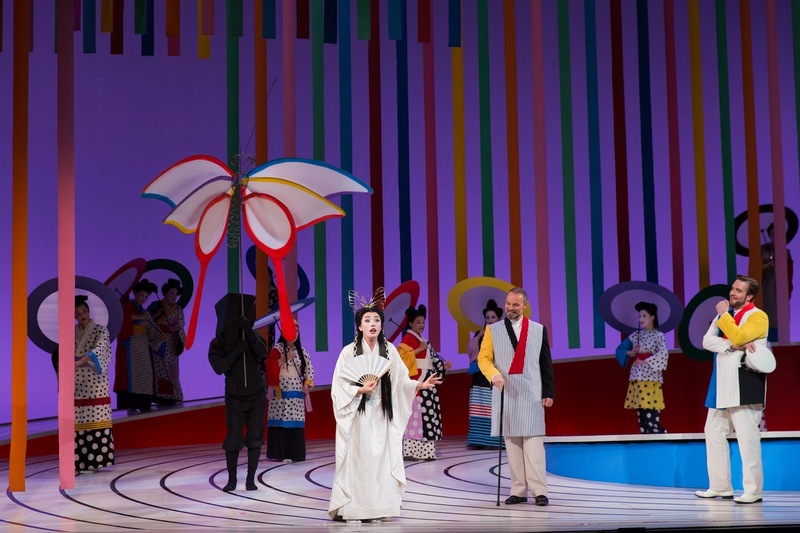 Even if it was less cumbersome than it appeared, hampering Cio-Cio-San with a butterfly headpiece was unnecessary, especially with a Julie Taymor-esque butterfly kite hovering above her: anyone who failed to realize that she was Madama Butterfly was not likely to appreciate the significance of the too-literal symbolism. The staging never impeded the relationship between the music and the listener, however, and the abiding unpretentiousness of Kaneko’s vision outshone the few flashes of affectation. The production’s most unforgettable tableau was that of the final moments of Butterfly’s life. The rising sun of Japan’s flag appearing on a projection that isolated Cio-Cio-San, the cut of her blade caused blood to stream from the familiar solar icon. Clearly, Kaneko intimated, it was the honor-at-any-cost culture of Japan as much as Pinkerton’s betrayal that claimed Butterfly’s life. The efforts of Director and Assistant Director Leslie Swackhamer and Cindy C. Oxberry, choreographer Adam Noble, and stage manager Lynn Krynicki yielded movement and blocking that were stylized but never nonsensical. The principal goal of traditional Japanese geisha culture has never been the comfort of its practitioners, but the recreation of Nagasaki’s social order on the Kennedy Center stage was mindful of the physical demands of singing, generally avoiding postures and positions that interfered with vocal projection. Under Gary Marder’s deftly-managed lighting, Anne Ford-Coates’s hair and makeup designs were handsomely unobtrusive, her ingenuity asserted by the ease with which the singers assimilated into the milieu of a fanciful but reasonably authentic Nagasaki. So much of the psychological depth of Madama Butterfly is woven into the shimmering silk of the music that a production team can achieve greatest success in staging the opera by looking to the score. Restraint is the measure of integrity in Cio-Cio-San’s world, and this production largely allowed her the dignity of singing without silliness or overwrought gesticulation. On the podium, WNO Music Director Philippe Auguin led the company’s choral and orchestral ensembles in a taut, sinewy traversal of the music. La fanciulla del West and Turandot are Puccini’s most aggressively modern scores, but Madama Butterfly, still too often dismissed as a weepy melodrama, is an inventive work. Under Auguin’s baton, the busy figurations that open the opera had, after a hectic, scrambled start, the acerbic bite of music by Stravinsky, suggesting the seedy underworld hidden by the colorful bustle of Nagasaki. Throughout the performance, Auguin liberated the score from saccharine sentimentality, magnifying details of the opera’s progressive harmonies without shifting focus away from Puccini’s trademark lush melodic lines. Though its tonal language is essentially late-Romantic, Madama Butterfly speaks a decidedly Twentieth-Century dialect, and it proved to be an accent of which Auguin is a master. The WNO choristers, directed by Steven Gathman, sang sweetly as Butterfly’s companions, zealously as the judgmental wedding guests, and heartily as the offstage sailors. Their performance of the Humming Chorus, a piece that captivates despite its banality, was hauntingly lovely, evocative of the unspoken thoughts that upend Cio-Cio-San’s optimism. Spurred by Auguin, the WNO musicians refused to be an uninvolved pit band. Why some musicologists and opera lovers persist in scoffing at Puccini’s skill as an orchestrator when there are so many embarrassingly sloppy performances of his operas is baffling, but WNO’s orchestra did Puccini and the audience the service of approaching Madama Butterfly’s difficulties with clear-sighted dedication to overcoming them. Clarity was the hallmark of this performance: at all volumes and all levels of dramatic intensity, Auguin and his musical collaborators were attentive to the patterns and textures of the music, neither accompanying nor commenting on the performance but fully, feelingly participating in it. 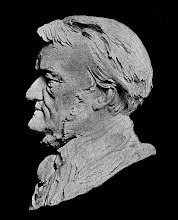 Every tenor who sings Goro faces a bevy of decisions to be made about his interpretation of the part. That Goro represents an unsavory stereotype is unmistakable, but that stereotype is as much—perhaps more—Western as Eastern. He is pragmatic and insouciantly opportunistic, but is he truly predatory? In this performance, tenor Ian McEuen gave the character a sardonic edge but stopped short of outright villainy. In Act One, McEuen’s recital of the virtues of the arrangements Goro has made for Pinkerton was brightly voiced. His utterance of ‘Vanno e vengono a prova a norma che vi giova’ exuded the high spirits of a man certain of being generously paid, but his expansive phrasing of ‘Una stella dai raggi d’oro’ hinted at pride deeper than that of a salesman praising his wares. 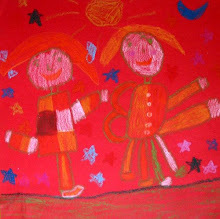 McEuen’s confident vocalism lent ‘Ecco! Son giunte al sommo del pendìo’ particular allure. The heartless laughter with which Goro mocks Cio-Cio-San’s innocent querying of Sharpless in Act Two about robins returning to roost was in McEuen’s performance like a thunderbolt: Butterfly was suddenly awakened to the reality of the outside world’s perception of her honorable fidelity. His ‘Il ricco Yamadori’ was more confiding than conspiring, and his ‘Dicevo...solo...che là in America’ rang with honesty rather than intentional cruelty. Possessing absolute security throughout the range of Goro’s music, McEuen had no need to resort to silly vocal effects or exaggerated enunciation, and he continues to refine his surprisingly subtle, intelligent interpretation of this often-loathsome character. 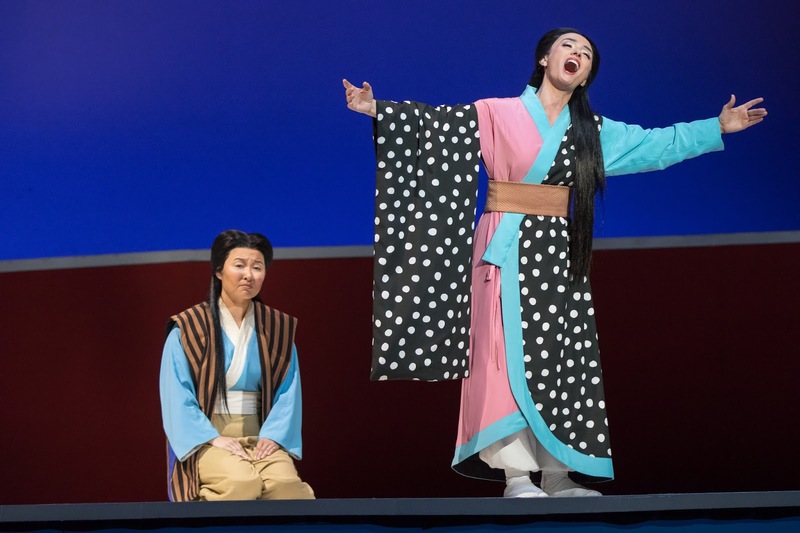 Cio-Cio-San’s maid and confidante Suzuki’s loquacious effusions in the Act One scene in which she meets her mistress’s fiancé were delivered by mezzo-soprano Kristen Choi with the excitement of a curious young girl eager to make a good impression. Tact is not foremost among Suzuki’s graces, but her lack of the demureness so carefully cultivated by her countrywomen is remedied by the breadth of her affection and concern for Cio-Cio-San. Choi voiced ‘Sorride Vostro Onore? Il riso è frutto e fiore’ with effervescent charm, not quite knowing what to say increasing rather inhibiting the flow of words. A palpable shift in demeanor overtook her as she uttered the prayer ‘E Izaghi ed Izanami sarundasico,’ the words still cascading from her tongue but the intent profoundly altered. It is also with prayer that Suzuki began Act Two, and her plea for the gods to end Cio-Cio-San’s weeping was touching. There was nothing malicious or coy in Choi’s singing of ‘Mai non s’è udito di straniero marito che sia tornato al suo nido,’ but her Suzuki rounded on the eavesdropping, gossiping Goro with blistering anger, her cry of ‘Vespa! Rospo maledetto!’ sung rather than shouted but slashing like a samurai’s sword. Choi delivered her part in the flower duet with rounded, attractive tones meticulously matched to those of her Cio-Cio-San. The simplicity with which she announced ‘Già il sole’ in Act Three touchingly conveyed the character’s physical and emotional exhaustion, and the tenderness evinced in her whispered ‘Come una mosca prigioniera l’ali batte il piccolo cuor!’ was heartbreaking. So engaging was this Suzuki that, as she slowly walked away in the opera’s final scene, separating Cio-Cio-San from her son for the final time, the gravity of the maid’s grief and uncertain future was overwhelming. Has she family of her own? Where will she go? 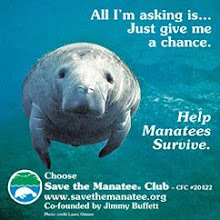 How will she survive? Singing and acting with absolute submersion in the rôle, Choi was a Suzuki who mattered. Equally dashing and drearily dutiful in the rôle of Sharpless, the American consul in Nagasaki, baritone Troy Cook gave this cog in the wheel of American diplomacy unusual dramatic significance and specificity. How could even the most callow Pinkerton who could ignore this Sharpless’s warnings about the dangers of toying with the affection of a girl as trusting as Cio-Cio-San? The opening phrase of the consul’s entrance in Act One, ‘E suda e arrampica,’ takes the singer to top G, and Cook ascended to the tone rousingly. The top Fs in ‘Ier l’altro, il Consolato sen’ venne a visitar!’ also resounded stirringly, but it was the ardor of his description of Cio-Cio-San’s naïveté that truly soared. Skeptical of Pinkerton’s intentions from the start, Cook’s Sharpless was a moral compass that his seagoing friend seemed incapable of reading. When Cook sang ‘Miss Butterfly...Bel nome, vita a meraviglia,’ it was genuine admiration rather than flattery. The consul’s Act Two visit to Butterfly with Pinkerton’s letter is a descendent of Violetta’s painful discourse with Giorgio Germont in Act Two of La traviata and a precursor of the poker scene in Act Two of Puccini’s La fanciulla del West. Cook voiced ‘Egli non vuol mostrarsi’ and ‘Ora a noi’ agitatedly, but the pity and sadness that shaped his rendering of ‘Io scendo al piano. Mi perdonate?’ radiated uncorrupted goodness. The ambivalence of the consul’s actions in Act Three weighted heavily on the man portrayed by Cook, his ‘Io so che alle sue pene non cì ono conforti!’ resolute but contrite, the consul’s gentle spirit crippled by the tragedy and his part in it. Cook’s mahogany-timbred, masculine singing occasionally seemed cautious, but he was an uncommonly thoughtful, introspective Sharpless. Whilst singers with greater name recognition amongst casual operaphiles prance and preen upon the world’s stages, peddling their tired warbling and wobbling as bona fide artistry, tenor Brian Jagde is in the trenches, battling to preserve and perpetuate the legacy of important American tenors epitomized by Richard Tucker. Jagde’s Pinkerton in WNO’s Madama Butterfly was a burst of raw virility, his boyish fervor tellingly complementing Butterfly’s childlike reticence. Goro’s demonstrations of the funny little house delighted him, and the febrile joy with which he sang ‘Dovunque al mondo lo Yankee vagabondo,’ hurling his golden top B♭ into the auditorium, was arresting. Then, his ‘Amore o grillo, dir non saprei’ was the libidinous credo of a young man who had not yet learned of love’s capacity to injure, the three top B♭s produced with giddy freedom. Pinkerton’s attraction to Cio-Cio-San is unquestionably primarily carnal, but Jagde sang ‘Vieni amor mio!’ with such open-hearted kindness and defended her against her family’s denunciation with such a heated ‘Sbarazzate all’istante. In casa mia niente baccano e niente bonzeria’ that he in those moments seemed not merely the owner of a bride but a husband. The tenor’s finesse gave his singing of ‘Bimba, bimba, non piangere’ and ‘Dammi ch’io baci le tue mani care’ a softness that his use of dynamics, generally preferring forte, lacked. Jagde opted to join his Butterfly on the top C that ends their love duet, thrillingly expressing the lieutenant’s uncontainable desire. Returning in Act Three not as Cio-Cio-San’s savior but as the instrument of her final humiliation, Jagde’s Pinkerton grasped the enormity of the consequences of his actions, albeit too late to alter them. Pinned between the unspoiled girl who so earnestly deserved his love and the ‘sposa americana’ who demanded it, only flight could restore his peace of mind. The voice throbbed with emotion as he sang ‘Datele voi qualche soccorso.’ Pinkerton’s aria ‘Addio fiorito asil di letizia e d’amor’ is undeniably self-indulgent, but Jagde imbued it with self-recrimination, damning his own crassness instead of wallowing in self-pity. Pinkerton never reappearing as Cio-Cio-San writhed in the agony of her last breaths, his offstage calls of ‘Butterfly!’ tormented the girl as life deserted her. Jagde’s excellent diction compensated for what his voice lacked in Italianate morbidezza, and his nuanced acting and superb singing transformed his Pinkerton from a hedonistic rake into a man sensitive enough to recoil from the blood on his conscience. 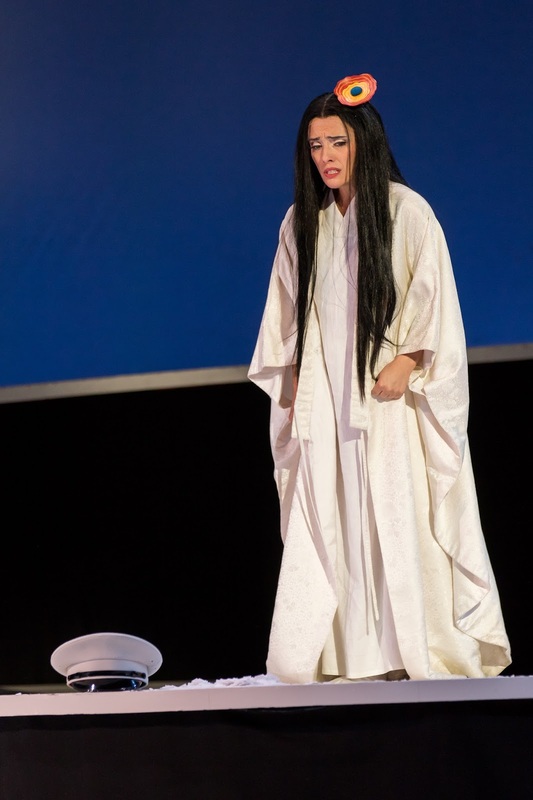 It is indicative of the significance of the appearance of Albanian soprano Ermonela Jaho as Cio-Cio-San in Washington National Opera’s staging of Madama Butterfly that, to date, the MET career of this artist, celebrated for both bel canto repertory and rôles as demanding as Puccini’s Suor Angelica, is confined to a single performance of Verdi’s La traviata—a disgrace that will thankfully be partially remedied when she takes her portrayal of Cio-Cio-San to New York in the 2017 – 2018 Season. Kennedy Center gained the prestige of hosting her first Butterfly in the United States, and she débuted at Washington National Opera with a performance of wrenching individuality and insight. Vocally, Jaho’s place on the Butterfly spectrum is somewhere between the extremes of the lyric coloratura Toti dal Monte and the heavier voices of Clara Petrella and Renata Tebaldi. Svelte and breathtakingly beautiful, her performance as Cio-Cio-San recalled the best singing of Anna Moffo. Whereas Moffo sang Butterfly only for Italian television and studio microphones, Jaho has found her own unique solutions to the rôles vocal riddles, shirking nothing. Dramatically, she was in this performance the equal of the best Butterflies on stage and on disc. She sang the entrance music in Act One, ‘Ancora un passo or via,’ gorgeously, ascending without strain to the top B♭s and crowning the passage with a secure sustained D♭6 that hung over the house like the fog that glides along the Potomac. Writers and listeners have marveled for a half-century at the ‘little-girl voice’ that Maria Callas adopted in Act One of Madama Butterfly, but the voice that sang ‘Siam giunte. F. B. Pinkerton. Giù’ and ‘Gran ventura’ in Jaho’s performance was that of a fifteen-year-old child transitioning into adulthood. The vocal colorations with which the soprano emphasized the very different sentiments of ‘Nessuno si confessa mai nato in povertà’ and ‘Morto’ made the text come alive: in a single word, the dishonor endured by Butterfly’s father changed the mood of the scene. Jaho’s expansive phrasing of ‘Ieri son salita tutta sola in secreto alla Missione’ evinced the profundity of her conversion to Christianity. Devastated by her family’s reject, this Butterfly clung to the comfort offered by Pinkerton, Jaho voicing ‘Non piango più’ with heartbreaking timidity. The floating melody of ‘Vogliatemi bene’ poured from the soprano like a ray of light, and her incredible pianissimi were matched by the pealing top B♭ to which she rose in ‘Dicon ch’oltre mare se cade in man dell’uom,’ asking Pinkerton whether it is true that men in other lands pin butterflies to boards and encase them in glass. The glistening top C with which she surrendered to Pinkerton’s ardor rushed from the soul of the character, not from a diva’s throat. Butterfly’s assertion that ‘L’americano Iddio son persuasa’ was greeted with laughter despite the seriousness with which it was presented, another instance of well-intentioned supertitles meddling with audiences’ comprehension of the contexts of words. The volcanic anger directed at Suzuki was tempered in Jaho’s portrayal by the realization that Butterfly has no one else upon whom to rely. In this performance, ‘Un bel dì, vedremo’ was not an interlude in the action but an organic advancement of it, the top B♭s determined and defiant. In the scene with Sharpless, the girlish playfulness returned in ‘Io son la donna più lieta del Giappone’ and ‘Yamadori ancor le penne dell’amor’—Butterfly was still no older than eighteen, after all. It was a woman and a frightened mother who voiced ‘Che tua madre dovrà prenderti in braccio,’ however, and, reminiscent of Callas’s Butterfly, this was the towering summit of Jaho’s performance. The bile that she largely swallowed when braving Suzuki’s doubts was unleashed on Goro, poignantly at odds with the maternal affection lavished on her son in ‘Vedrai, piccolo amor’ and the frenzied ecstasy of her sighting of Pinkerton’s ship. Showering her son in flower petals, Jaho’s Cio-Cio-San intoned ‘Scuoti quella fronda di ciliegio’ enchantingly, blending lusciously with her Suzuki and reaching the three top B♭s effortlessly. The dramatic juggernaut of Act Three progressed from a lovingly-voiced ‘Tu Suzuki che sei tanto buona’ to an exquisitely poised ‘Sotto il gran ponte del cielo non v’è donna di voi più felice’ that was disturbing in its eery serenity. Droning ‘Con onor muore chi non può serbar vita con onore’ on Fs at the bottom of the stave as she read the inscription on the blade that once feasted on her father’s blood, the warmth of life was already gone from this Butterfly. As Jaho sang it, ‘Tu? tu? tu? tu? tu? tu? piccolo Iddio!’ wielded the cataclysmic impact of Isolde’s Liebestod and Brünnhilde’s immolation. Those heroines are not mothers, and there was in Jaho’s almost unbearable depiction of Cio-Cio-San’s death a sense that it was the dishonor of being parted from her child rather than that of being abandoned by her husband with which she could not live. Some singers mistake Cio-Cio-San for a dragonfly, majestic but inert, and others for a moth, industrious but indistinct. Jaho’s Cio-Cio-San was truly a butterfly, one so real that it seemed that, if touched, her wings would leave stains of their incandescence on the molesting hands. 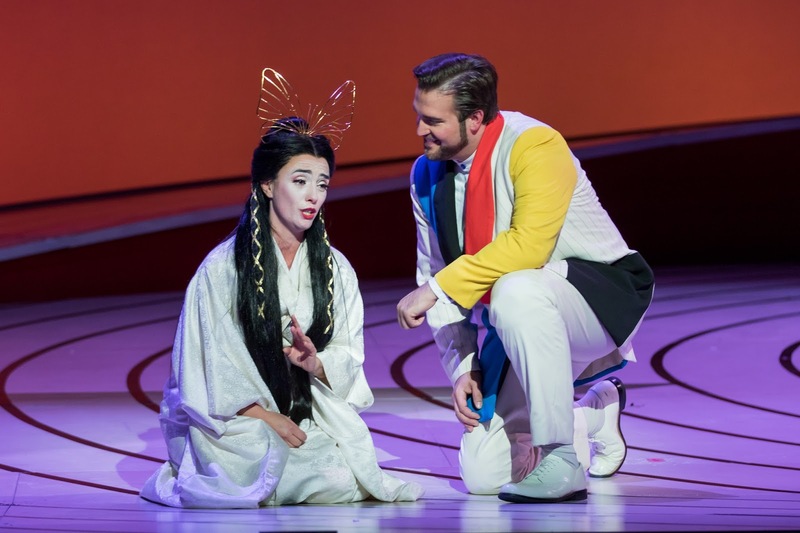 More than a century after the première—or, rather, premières—of Madama Butterfly, audiences continue to weep for Cio-Cio-San, sometimes without knowing or acknowledging why. 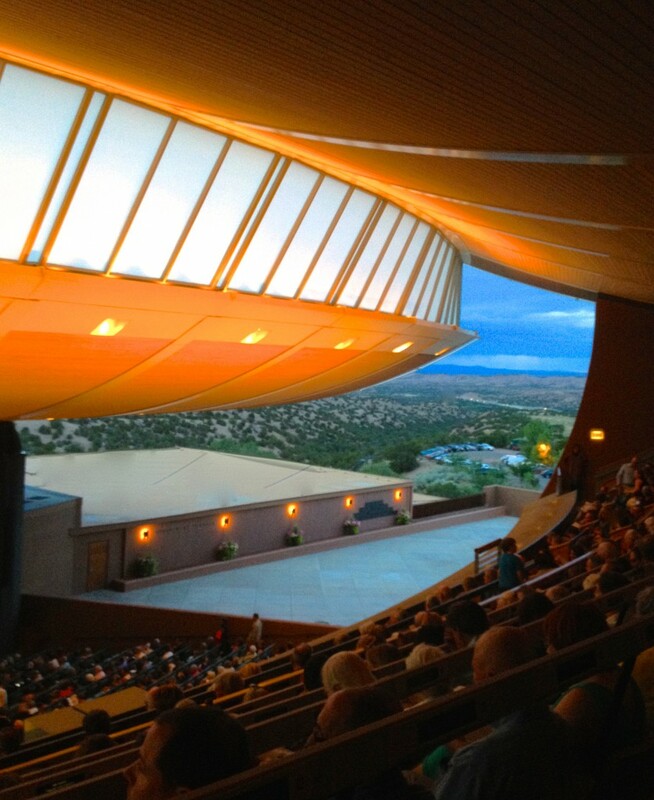 Admittedly, the opera’s narrative is simplistic and formulaic. From an academic perspective, audiences know that what transpires upon the stage is only artifice, designed to manipulated the emotions, yet audiences feel a connection to the opera’s heroine. Bountiful as the ranks of those who seem immune to it are, compassion is a basic human compulsion, and to witness the thoughtless destruction of a being as bewitching as Cio-Cio-San, even in an incarnation who does not sing well, without responding on some level to her tragedy is virtually inhuman. Still, a Butterfly without a compelling Cio-Cio-San is like an empty cage: it is possible to be trapped, but escape is easily achieved. Even within the expanse of Kennedy Center, escaping the wingspan of Ermonela Jaho’s sublime Butterfly was impossible. Portrayed by a great artist, the death of that precious creature wounded with the sting of a personal loss. Whether in verse or in verismo, is there anything more relevant than that?